Raj Kapoor was not a nice man to know. He made a fool of himself when he was drunk. He promised Nargis that he would marry her and in the meantime he produced two more children with his wife. She was his partner in R.K. Films, but it was his role that was the focal point of all his films. In the end, in Jagte Raho, Nargis was given only 10 minutes of film time. We know he cheated on his wife, but he cheated also on his mistress. Raj Kapoor had a feudal attitude towards women. He often showed them falling at the feet of their men or taking the occasional slap. Nargis and Raj Kapoor acted together in 16 films between 1948 and 1956. He would not allow her to act opposite anyone else, especially Dilip Kumar, of whom he was intensely jealous. Mehboob Khan, who discovered her, wanted her for the lead in Aan but her lover did not allow it. 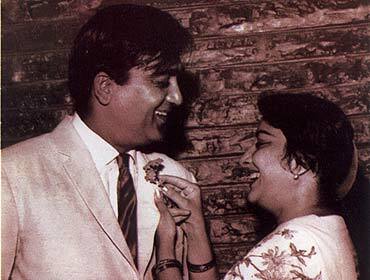 In that respect, Sunil Dutt, her husband, was no better. He would not let her work opposite established actors like Dev Anand. Towards the end of her career she had to be cast opposite second-rate actors like Pradeep Kumar. You will learn this and more in Kishwar Desai’s elegantly written Darlingji, The True Love Story of Nargis and Sunil Dutt. The ‘Darlingji’ part of the title is rather silly, while the rest of it is misleading. This book is really about Nargis, with Raj Kapoor and Sunil Dutt playing supporting roles. The most interesting part comes at the beginning. There is a hint, a subtle one, that Indira Gandhi and Nargis Dutt were probably cousins. More than a 100 years ago, the paths of Indira’s grandfather, Motilal Nehru, and Nargis’s grandmother, Dilipa Devi, crossed in Allahabad. They lived in the same haveli and knew each other. Motilal was married to a morbidly depressive Swaroop Rani and was unhappy. Ms Desai suggests hanky panky between the two and Jaddanbai, the mother of Nargis, was their love child. Ms Desai is walking on egg shells here, but the suggestion is unmistakable. We can settle this easily. We have two bright, young MPs, Rahul Gandhi and Priya Dutt. They should be encouraged to take a DNA test to see if they are related. But don’t hold your breath. Jaddanbai was a singer by profession and a free spirit. She had three children from three men, but married only one of them. The father of Nargis was a Brahmin, Mohanbabu, without a job or a prospect of one. He called his wife Jayadevi when it suited him and Jaddanbai called him Abdul Rashid. The father of one half brother, Akhtar, was a wealthy Gujarati businessman, Bachhubhai. Anwar was the result of Jaddanbai’s liaison with her harmonium player. One of the endearing things about the family was its easy swing between Islam and Hinduism. Nargis had a happy childhood but matters deteriorated rapidly after her parents died in 1948. She became the sole breadwinner in a very extended family. Nineteen of them lived in a three bedroom flat on Marine Drive. Visiting relatives were accommodated on seven charpoys lined up in the corridor outside the bedrooms. The villain of the piece was her elder half brother who used to beat her up. To quote: "She asked him how long he expected her to work, and to her horror, he said, ‘Till your last breath’. According to Akhtar, she was just an actress and not suited for marriage at all." The reader will find the first half of the book, until Nargis parts company with Raj Kapoor, more interesting. The story of the Dutts, which begins when they meet on the sets of Mother India, is better, and more succinctly, told by their two daughters in another recent book, Mr and Mrs Dutt. As for the films of Nargis, Desai relies too heavily on the reviews in Filmindia, a scurrilous magazine that disappeared when Filmfare arrived in 1952. Its editor and publisher, Baburao Patel, was a blackmailer. A film would get a good review if it was advertised in the magazine, preferably on the cover, and a bad one if it wasn’t. As far as Baburao was concerned, Mehboob Khan could do no wrong. As for others like Chandulal Shah of Ranjit Movietone and Sohrab Modi of Minerva, he would write terrible things on their personal lives and films. I remember V. Shantaram’s Jhanak Jhanak Payal Baaje being famously dismissed as "the mental masturbation of a senile mind".